George Drake and Helene Drake scored 1.20 masterpoints with a 58.59% game at Bridge On Shea. See full results of this game. John Babb and Ken Batko scored 0.55 masterpoints with a 50.64% game at Bridge On Shea. See full results of this game. George Drake and Helene Drake scored 1.38 masterpoints with a 58.33% game at Bridge On Shea. See full results of this game. 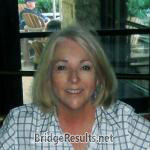 Gayle Quiros and Judith Washor scored 2.53 masterpoints with a 55.37% game at In Tempo Bridge Club. See full results of this game. Edwin Katten and Joan Beuchel scored 1.40 masterpoints with a 58.33% game at In Tempo Bridge Club. See full results of this game. Marc Raphael and Ken Batko scored 0.91 masterpoints with a 58.1% game at Bridge On Shea. See full results of this game. Lynda Thal and Jill Grundland scored 3.29 masterpoints with a ★60.36%★ game at Bridge On Shea. See full results of this game. Dan Lavine and Sheryl Martin scored 0.60 masterpoints with a 52.64% game at Bridge On Shea. See full results of this game. George Drake and Helene Drake scored 1.10 masterpoints with a 57.22% game at Bridge On Shea. See full results of this game. Evan Lancaster and Thom Saudargas scored 0.24 masterpoints with a 50.43% game at Bridge On Shea. See full results of this game. Helene Drake and George Drake scored 1.43 masterpoints with a 58.17% game at Bridge On Shea. See full results of this game. Sharon Teitel and Gary Dubro scored 1.02 masterpoints with a 57.81% game at Bridge On Shea. See full results of this game. 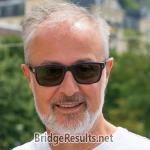 Richard Gitter and Kaye Kulesh scored 0.71 masterpoints with a 56.12% game at Bridge On Shea. See full results of this game. Dan Lavine and Joan Beuchel scored 2.30 masterpoints with a ★61.98%★ game at Bridge On Shea. See full results of this game. Evan Lancaster and Thom Saudargas scored 0.48 masterpoints with a 53.61% game at Bridge On Shea. See full results of this game. John Urciuoli and Vinda Gross scored 0.29 masterpoints with a 52.64% game at Bridge On Shea. See full results of this game. Helene Drake and George Drake scored 0.37 masterpoints with a 54.17% game at Bridge On Shea. See full results of this game. Bill Berry and Judith Washor scored 0.34 masterpoints with a 53.7% game at Bridge On Shea. See full results of this game. Helene Drake and George Drake scored 0.39 masterpoints with a 56.97% game at Bridge On Shea. See full results of this game. Richard Gitter and Sheryl Martin scored 2.22 masterpoints with a 58.41% game at Bridge On Shea. See full results of this game. Kaye Kulesh and Richard Gitter scored 0.45 masterpoints with a 57.6% game at Bridge On Shea. See full results of this game. Lawrence Teitel and Sharon Teitel scored 0.58 masterpoints with a 57.26% game at Bridge On Shea. See full results of this game. Lydia Sweet and Tom Wylie scored 1.58 masterpoints with a 58.84% game at Bridge On Shea. See full results of this game. Barbara Paton and M Barry Smith scored 0.55 masterpoints with a 52.31% game at In Tempo Bridge Club. See full results of this game. Ken Batko and Marc Raphael scored 0.67 masterpoints with a 54.23% game at Bridge On Shea. See full results of this game. Alice Pierce and Alice Bendheim scored 1.38 masterpoints with a 54.81% game at In Tempo Bridge Club. See full results of this game. George Drake and Helene Drake scored 0.88 masterpoints with a IMP game at Bridge On Shea. See full results of this game. Dan Lavine and Sheryl Martin scored 0.88 masterpoints with a IMP game at Bridge On Shea. See full results of this game. Lydia Sweet and Stacey Langerman scored 0.42 masterpoints with a IMP game at Bridge On Shea. See full results of this game. Lynda Thal and Jill Grundland scored 0.46 masterpoints with a IMP game at Bridge On Shea. See full results of this game. Richard Gitter and Kaye Kulesh scored 0.26 masterpoints with a 52.78% game at Bridge On Shea. See full results of this game. Andy De Leon and Kim Corbin scored 0.30 masterpoints with a 50.64% game at Bridge On Shea. See full results of this game. John Hay and Alice Bendheim scored 0.43 masterpoints with a 52.27% game at Bridge On Shea. See full results of this game. John Urciuoli and Ken Batko scored 2.48 masterpoints with a ★67.14%★ game at Bridge On Shea. See full results of this game. Charlie Kelley and Jill Grundland scored 0.87 masterpoints with a 57.52% game at Bridge On Shea. See full results of this game. Bud Marsh and Andy De Leon scored 0.41 masterpoints with a 53.5% game at Bridge On Shea. See full results of this game. Mary Olsky and Joan Beuchel scored 1.31 masterpoints with a 52.48% game at Bridge On Shea. See full results of this game. John Urciuoli and Vinda Gross scored 0.40 masterpoints with a 52.26% game at Bridge On Shea. See full results of this game. Lawrence Teitel and Sharon Teitel scored 0.56 masterpoints with a 55.46% game at Bridge On Shea. See full results of this game. Gayle Quiros and Judith Washor scored 4.50 masterpoints with a ★60.58%★ game at In Tempo Bridge Club. See full results of this game. Andy De Leon and Kirt Hall scored 0.27 masterpoints with a 51.54% game at Bridge On Shea. See full results of this game. Ken Batko and John Babb scored 2.66 masterpoints with a ★62.5%★ game at Bridge On Shea. See full results of this game. Edwin Katten and Joan Beuchel scored 0.60 masterpoints with a 59.14% game at In Tempo Bridge Club. See full results of this game. Helene Drake and George Drake scored 3.06 masterpoints with a ★63.35%★ game at Bridge On Shea. See full results of this game. Alice Pierce and Alice Bendheim scored 0.98 masterpoints with a 50.37% game at In Tempo Bridge Club. See full results of this game. John Urciuoli and Vinda Gross scored 1.23 masterpoints with a 57.2% game at Bridge On Shea. See full results of this game. Evan Lancaster and Barbara Paton scored 1.31 masterpoints with a 54.68% game at Bridge On Shea. See full results of this game. Sheryl Martin and Gary Dubro scored 0.43 masterpoints with a 51.92% game at Bridge On Shea. See full results of this game. John Urciuoli and Vinda Gross scored 0.26 masterpoints with a 52.21% game at Bridge On Shea. See full results of this game. Ken Batko and John Babb scored 0.71 masterpoints with a 53.56% game at Bridge On Shea. See full results of this game. Evan Lancaster and Thom Saudargas scored 1.27 masterpoints with a 56.15% game at Bridge On Shea. See full results of this game. Andy De Leon and Kim Corbin scored 1.63 masterpoints with a 57.98% game at Bridge On Shea. See full results of this game. Mady Stoll and Silas Wasserstrom scored 0.81 masterpoints with a 51.25% game at Bridge On Shea. See full results of this game. John Hay and Alice Bendheim scored 0.68 masterpoints with a 49.92% game at Bridge On Shea. See full results of this game. Francine Dobkin and Jill Grundland scored 0.59 masterpoints with a 51.76% game at Bridge On Shea. See full results of this game. Sharon Teitel and Dee Horwitz scored 0.36 masterpoints with a 54.33% game at Bridge On Shea. See full results of this game. John Urciuoli and Vinda Gross scored 2.62 masterpoints with a 58.82% game at Bridge On Shea. See full results of this game. George Drake and Helene Drake scored 0.47 masterpoints with a 53.72% game at Bridge On Shea. See full results of this game. Lydia Sweet and Tom Wylie scored 0.68 masterpoints with a 56.8% game at Bridge On Shea. See full results of this game. Ken Batko and John Babb scored 0.84 masterpoints with a 57.86% game at Bridge On Shea. See full results of this game. Judith Washor and Gayle Quiros scored 0.24 masterpoints with a 52.56% game at Bridge On Shea. See full results of this game. Lydia Sweet and Stacey Langerman scored 0.96 masterpoints with a 54.2% game at Bridge On Shea. See full results of this game. Dan Lavine and Sheryl Martin scored 0.45 masterpoints with a 55.02% game at Bridge On Shea. See full results of this game. Helene Drake and George Drake scored 2.79 masterpoints with a 59.97% game at Bridge On Shea. See full results of this game. Ken Batko and John Babb scored 0.36 masterpoints with a 51.08% game at Bridge On Shea. See full results of this game. John Urciuoli and Sheryl Martin scored 1.80 masterpoints with a ★62.5%★ game at Bridge On Shea. See full results of this game. Richard Gitter and Edward Schwartz scored 0.25 masterpoints with a 52.52% game at Bridge On Shea. See full results of this game. Andy De Leon and Kim Corbin scored 0.36 masterpoints with a 52.21% game at Bridge On Shea. See full results of this game. Helene Drake and George Drake scored 0.58 masterpoints with a 55.66% game at Bridge On Shea. See full results of this game. Jill Grundland and Charlie Kelley scored 0.45 masterpoints with a 50.85% game at Bridge On Shea. See full results of this game. Deborah Russell and Jill Grundland scored 0.28 masterpoints with a 51.7% game at Bridge On Shea. See full results of this game. Andy De Leon and Kirt Hall scored 0.60 masterpoints with a 53.19% game at Bridge On Shea. See full results of this game.